So I've recently been thinking about getting business cards, just not for work. Yes, I know it's random, but you know I'm random anyways so let's just run with it. But they can be used for a great purpose - MARKETING YOURSELF! And hey, what's wrong with that? 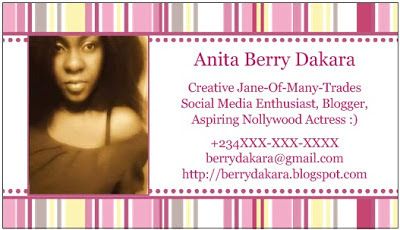 In my Nollywood quest, a card like that could get into the right hands and before you know it, I'd be the next Genevieve, BERRY DAKARA, Actress Extraordinaire! Here's a design I'm playing with on VistaPrint. I think I like it very much. I just got a vistaprint business cards as well. Can't wait to start dishing out mine. Good design and right template used.Business cards has become our necessity due to the changing business trends.Its now necessary to have more contacts and relations.